Dog Days Weekend: Five Restaurants To Try | Crystal Water Villas Blog - Lake of the Ozarks! Olive Branch Restaurant: May your time at the Olive Branch be a new beginning for you. Look around you at the friends and family enjoying the good food and fellowship of this place. Many a new beginning got its start over a good meal, and many a person has felt at peace and in harmony with the world after a time of fellowship and dining. It was for this purpose that the Olive Branch came in being. It is more than a restaurant; it is a gathering place once again just as it was when it was a church. The Duck: This distinctive lakefront dining experience features both traditional favorites and innovative creations prepared with the freshest ingredients by our culinary staff. Whether on our covered deck, screened porch or inside dining rooms, you’ll find great dining in a great lakefront setting. Baxter’s Lakeside Grille: Our classic American restaurant builds on the rich history that the Lake Area is known for. All of the restaurants we brought to the Midwest share a common commitment: use only the finest, freshest ingredients, coupled with personal service and warm, inviting surroundings. 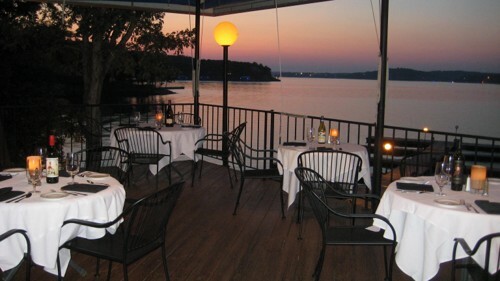 The Blue Heron Restaurant: Tuesday through Saturday, your host Joseph H. Boer invites you to a dining experience at the Lake of the Ozarks. When it comes to win, The Blue Heron is second to none: 3 Consecutive Years at the Potted Steer Winner of the Wine Spectator Award of One of the 100 Best in the World. Cheers! JB Hooks: JB Hooks’ dining room overlooks a panoramic view of the main channel of the Lake, and offers a relaxing atmosphere to add to your dining experience.